A few months ago Inhabitat reported that an iceberg 10 times the size of Manhattan broke away from the Antarctic into Pine Island Bay. 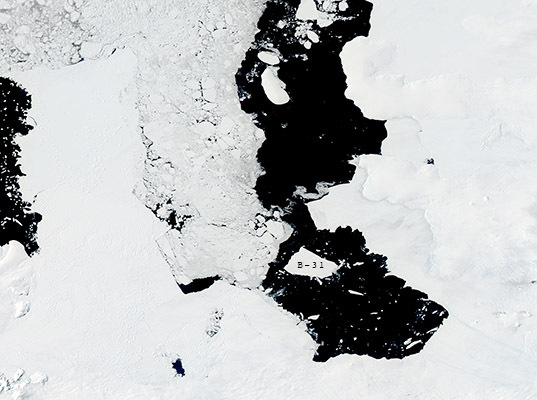 Now that iceberg is drifting out of the bay and into the currents of the Southern Ocean. The breakaway – known as iceberg B-31 – snapped off in November, 2013 and though NASA was prepared for the event, it has prompted the agency to keep an eye on the potentially dangerous 20-mile wide iceberg as it heads toward shipping lanes. The iceberg was originally about 275 square miles, though it has slowly been melting and now takes up about 250 square miles. To keep track of the iceberg, NASA has satellites watching it and the British Antarctic Survey airplanes dropped 37 GPS tracking units onto the surface. The GPS is particularly useful because it can be hard to track icebergs, even one this size, in the darkness of the Antarctic winter. Rogue icebergs can be just as dangerous today as they were when one sank the HMS Titanic in 1912. Shipping has increased in the Antarctic areas in past years and, at the same time, more icebergs of all sizes are breaking away, a process known as calving, than ever before. Even with modern warning systems, icebergs can still pose a threat and can sink ships, like the MS Explorer in 2007. While this may be a particularly massive piece of ice, it isn’t the biggest iceberg ever measured. That award goes to B-15, an iceberg twice the size of Delaware which broke away in 2000. Because of increasingly warm waters, more and more icebergs, including enormous icebergs like B-15 and B-31 are breaking away and scientists believe that we can only expect things to get worse. Scientists are particularly interested in calving from this area of the Antarctic, which some believe is melting particularly quickly, making it one of the biggest contributors to sea level rising. You can watch a video of the icebergs birth and journey here. Ice falling in will raise sea level and that will happen instantly. The melting wont be necessary to register the sea level change. Imagine how huge Central Park would be. It may be 33 by 20 km at its widest and longest points, but it's not rectangular so multiplying the two dimensions wouldn't be the correct way to measure the surface area. Great catch - although the NASA article states that the iceberg is 8x the size of Manhattan, by my calculations the iceberg is actually closer to 10x the size. Using NASA's current iceberg dimensions (33 by 20 km), the iceberg is about 254 square miles. According to the US Census, Manhattan is just under 23 square miles, making the iceberg over 10x the size of Manhattan. Im not sure how your story says that the iceberg is 10x the size of Manhattan when the related video notes 8, is there another source which has been used to derive that number? 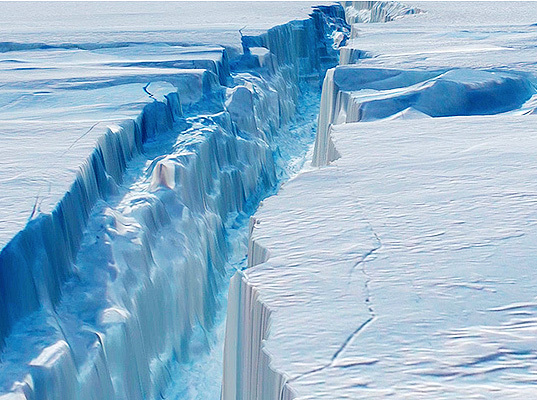 Canyon formed in the ice as B-31 broke away.